For those who have something a little more sunset and sandy in mind, you'll have to head to St Kilda, the suburb that has exploded in a summery froth. The Espy, the once gloriously grand and later gratuitously scuzzy music venue that knows all your secret shames, has risen like a fancy phoenix with six floors of band rooms, restaurants, bars and professional podcast studios for community use. The Prince Dining Room is about to bring the ex-Circa site back to life at any minute. In light of this, Captain Baxter, the restaurant crowning the Sea Baths, has had a nip and tuck to level up with its new opponents. 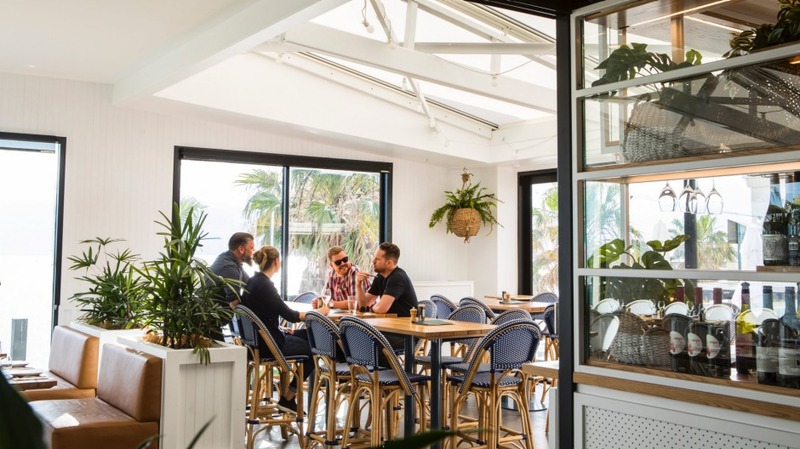 When Baxter opened in 2014, it was a glittering, bright and breezy magnet to those who wanted to be wedged exactly between a sunset and the perfect filter; a well stocked bar and the beach. The dress code was talons, tees and tans. That hasn't changed, but there is a fresh look in 2018, and new chef blood in the form of Tim Martin (ex-European), and Adrian Hawkins (ex-Est) have joined executive chef Matt Dawson in nudging the menu in a fire and fish-focused direction. Parts of this new package are better than others. 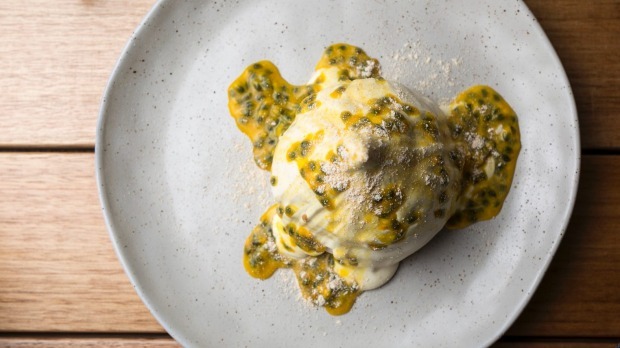 But what probably matters more is where all this places Baxter in St Kilda's new dining order. The Espy's $15 million reno will give you stunner sunsets but here you are literally on (or at least above) the beach. Huge picture windows give you an eyeful of the sand in two directions. The front roof retracts entirely for bonus breeze. The white and navy wicker chairs, ash wood tables and tan banquettes is like camouflage to most of the clientele. The beach party vibes, enhanced if you summon a seafood platter and a bottle of bubbles or a salty and citrusy gunpowder margarita, are high. On drinks, cocktails both creative and classic are decently shook, look good and if you want, come in jugs. Taps spruik a few crafty beer options beyond the big contract obligations and there are a dozen price-spanning sparkling wines from a $49 King Valley moscato to 2009 vintage Dom Perignon for $445. Food-wise, there's a seafood and sometimes pan-Asian bent, but it's a surprisingly hefty carte. Sometimes that's excellent. Crunchy vinegar-dusted and saltbush-sprinkled potato cakes are beer snacking legends with their mildly citrusy mayo. 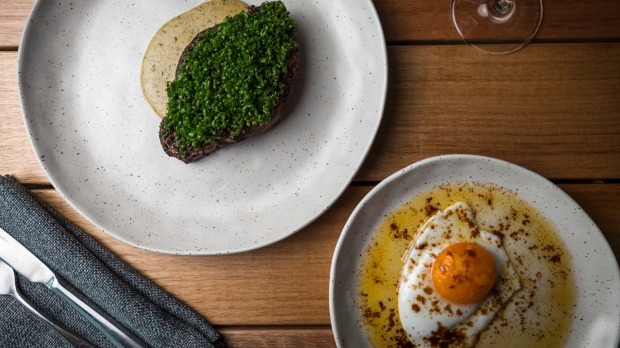 A chive-shrouded O'Connor steak with an optional fried duck egg and bone marrow is a strong way to die when it's cooked this nicely, all pink and bronzed in the right bits. But this kitchen really loves a crutch of luxurious fats, which can numb your tastebuds in a hurry. Next time, I'd switch my snack order to crudo fish dishes (tuna with ponzu and raw cobia) over mouth-coating duck tsukune (meatballs with an egg yolk and soy dipper), or seaweed crackers loaded with whipped fish roe then extra fishy bottarga. All oof, no ahh. Roast kipfler potatoes, split and drenched in thick satay sauce, fragrant curry leaves and luminous oil require a week of leg days to work off. Beneath a golden pastry hat, the fish pie contains quite firm smoked trout and bouncy scallops in a molten cheesy lava. Swimmer crabs in chewy chilli caramel are almost light reprieve because they take so much work to access. 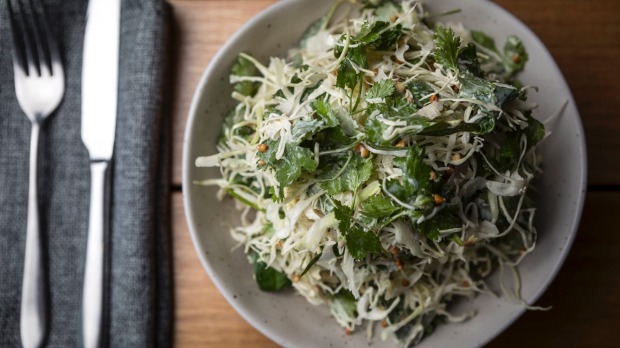 Even our two salads (crisp shaved cabbage peppered with nutty buckwheat and crisp baby gem lettuces) are coated with dressings. The banana-cream-filled pavlova, half hidden by a sliding cream and passionfruit avalanche, is the stuff of delicious night terrors. Tasty? Yes, but a bit one note. A little light and sparkle would really lift the tone. Same goes for the service, which is friendly, if a bit vague on detail and knowing when not to torpedo tables' conversations. That's a skill they need to learn. Because Captain Baxter has the views, but they need the moves now that it's game, set, St Kilda. Pro Tip: If you don't like to fight a noisy room, avoid. 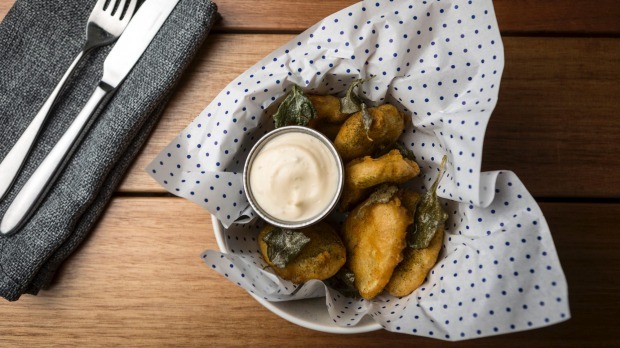 Go-to Dish: Potato cakes with saltbush ($14).